West of mainland Scotland, 24 miles across the Minch, is the Isle of Lewis. This is the largest and northernmost island of the Outer Hebrides and is the island where the famed Lewis Chessmen were discovered. Rich in history, the Isle of Lewis is also rich in a way of life that seems most difficult to find elsewhere in the world. Lewis is comprised of 683 square miles and a population of approximately 20,000. 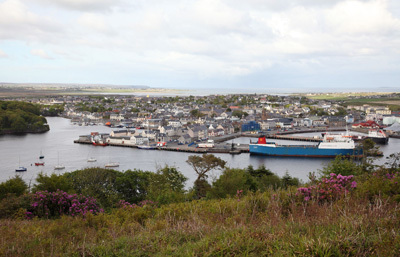 The only town on the island is Stornoway, which is home to one third of the population. The numerous small villages that are sprinkled across the land are home to the remainder of the people that live on the island. 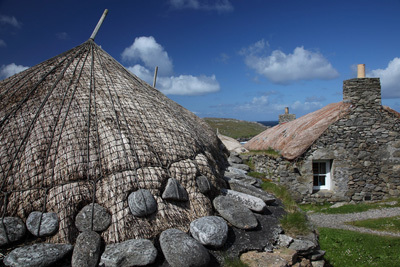 Life on the Isle of Lewis is traditional and many of the traditions are centuries old. The long-standing industries on Lewis have been crofting, fishing and weaving. Though each of these industries has declined as a sole means to earn a living they are still alive and maintain an important role in life on the island. The weaving industry on Lewis is most famous for the Harris Tweed that was such a popular fabric for jackets. The demand for this fabric may not be as large as it had been previously but the tweed is still made according to high standards of quality. Machines have taken over the spinning and dying process but, as always, Harris Tweed is hand-woven in the original manner that has traditionally served it well. The main fishing fleet has been diminished from the large force that it had been. The smaller fleet works in conjunction with fish farms and processing plants that perform on shore in order to keep fishing an active and viable industry regardless of any perceived decline. Bringing in revenue of approximately £45 million each year, tourism has been the only major commercial industry to have grown. Tourism is the driving force that has 40 percent of the working population being employed by the public sector. There is irony in this as tourism on the Isle of Lewis is most decidedly not a commercial experience. Tourists that vacation on Lewis are those that want to experience the historical features, wildlife in the form of flora and fauna, and the unbelievably breathtaking beaches that all combine to make this island what it is now and has always been – a retreat. 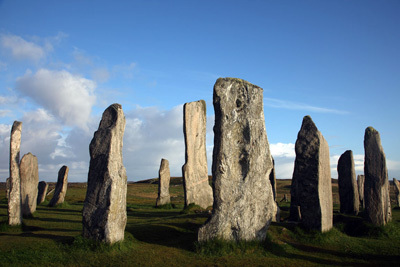 Excluding the site where the Lewis Chessmen were reported to have been found, the historical attractions of Lewis that draw the most attention are the Callanish Standing Stones, that date back to a time before 1500 BC, and the black houses. There are a number of black houses still standing, which seems incredible for structures that were built during the Iron Age and were still lived in until the 1970s. History is also found in Lewis tradition by the strict religious observance shown on Sunday. The larger hotels on the island have been granted flexible licenses that allow them to operate on Sundays. Excepting those hotels and very few other amenities that is a day that island pretty much closes the door to business. Visitors to the Isle of Lewis are encouraged to contact their place of lodging in order to establish the Sunday observance of the business. Businesses may shut down on Sunday but the wildlife, beaches and historical landmarks are constrained by no such boundaries. Visitor centres and restrooms may be closed but the land itself remains open for exploration, investigation and relaxation.